It's been a long time since we've had Hood ice cream on the blog. Oh sure, we had their neat new greek frozen yogurts on the blog earlier this year (raspberry granola was my favorite), but their actual ice cream? Yeah, it's actually been four years. 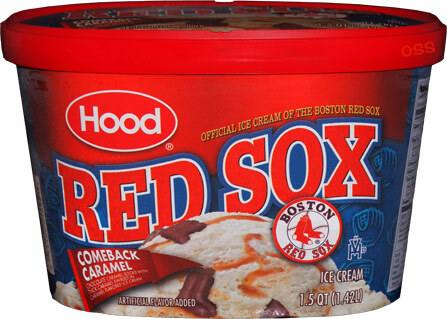 The following was one of four Hood Red Sox flavors announced at the end of 2007. Now we (a.k.a. me) need to keep in mind that this is what I call an "entry" level ice cream, or you might call it a budget ice cream. It's the kind of stuff you consider buying when you have to feed lots of people. I'm not trying to pick on it, I know a lot of people who are hooked on Hood, I'm just trying to paint a picture here. The opening shot is pretty boring, so let's dig down to something a bit more inspired. It looks fine here and it looks cool enough in the bowl too. Grabbing some swirl... yup, it's sweet. 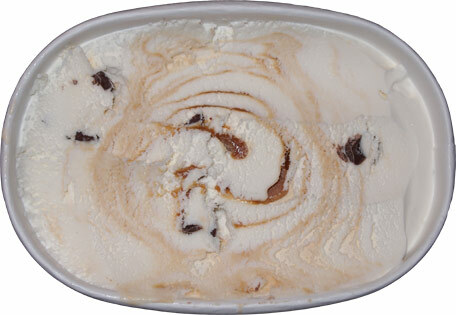 I'm totally having flash backs to Friendly's Caramelot from last weekend. It's similar, but there's something missing. Hehehe, the little socks are so cute and little! (sorry, couldn't resist saying that). Funny, the socks remind me very much of the cups I found in Friendly's flavor (maybe they are coming from the same place?). They aren't an exact match, but they are similar. They've got that real strong caramel vibe that I don't know how to describe again. I don't want to say coffee again, but it's something. Weird, I let them melt on the old tastebuds and they taste totally different that way since the chocolate and caramel are blending... still something there though. Ahhhh, why can I not describe anything anymore. The problem with the socks is that they are so tiny they become a bit of a non factor. You get the little flavor hit, but it's a little hit, not enough to spice things up like with the bigger Friendly's cups. They definitely leave you wanting more (literally and figuratively). Wow, that small serving went fast. Guess we'll have to try this again tomorrow! On Second Scoop: I kind of neglected to analyze just the base flavor yesterday. Well, I did today, and saying it's caramel flavor is a bit of a stretch. There may be a hint of it in the base, but it's really weak. At least a vanilla base would have been more flavorful and taken this one up a notch. Thankfully the swirl is sweet enough and prevalent enough that you probably won't notice too much. It's an ok ice cream in need of a stronger base, and I've had worse, I'm just not feeling it. I want better... I want a bit more flavor... my wife just chimed in "at least it's not frozen dairy dessert". touché. Buy Again? my wife says yes! I thought the same thing about the socks...such a cute idea!